OMG, my youngest daughter just turned 40 (ouch) and I made this card for her. The outside says, "I'm corn-fused" and the inside reads, "You can't be 40 ... I'm only 29!" 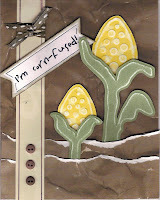 I've had this corn template from Lasting Impressions for quite a while and this was the perfect time to use it. I'm always "corn-fused" so I think I shall get a lot of use out of the simple design. Donna, this is so adorable!! I love all the textures and the sentiment is hilarious. I bet she loved it! Hope the pyrimage worked out for you! I love the way you come up with the perfect sentiment for your cards.......and I'm only 29 too!